A building collapsed in Grandpass yesterday evening killing seven workers and injuring another two. The building belonging to Adam Exports, was used for packaging of spices, located at Babapulle Mawatha, Grandpass. Among the dead are four females and three males, while two persons, a male and female, are in hospital. Their condition is also said to be serious. Rescue teams carrying an injured worker to an ambulance. According to eyewitnesses, the incident had occurred around 3.00 pm and there were around 12 workers in the building at the time of the collapse. However, three of the workers had managed to escape unhurt, while the others were trapped within the building. The building is said to be around 130 years old and some demolition work had been going on in the building behind it. According to Army rescuers, a wall from the building that was being demolished had fallen onto the spice packing building causing the roof and several walls of it to collapse, trapping the workers within. “We were outside and we heard this big sound and we saw the whole building covered in dust. We ran towards it and there we saw our boss Thahir Gulamhusein on the ground and we first dragged him out. At the time he was alive. By his side was his trusted assistant and stores manager Sujee who had been here for over 20 years. But he was dead. Later even our boss had succumbed to his injuries,” said L.M. Premachandra and Prasanna Gunasekara who had been working in the tea section for over 20 years. The Fire Brigade, Army and Air Force personnel were deployed in rescue efforts. 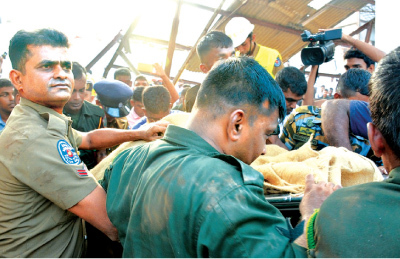 Around 60 Army personnel were deployed for the rescue efforts.